Hi loves! How are you this Sunday? Any plans? In Holland it is Father's Day today, but I am actually not visiting my father (shame on me) because we have a birthday party to attend - my best friends son turned 4 last week! 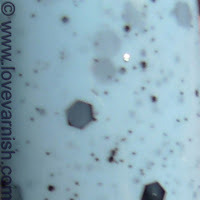 Today I have quite the post for you - swatches & review of 6 polishes, all from the El Corazon Easter Eggs collection! These are a fun and bright colored take on the speckled trend, with the same kind of black glitter in each polish. The shades are all very different and there is something in this collection for everyone! Formula was the same for 4 out of 6 polishes, the other 2 (number 423-100 & 423-102) I'll describe seperately. These polishes are sheer and feel a little watery, so not jelly sheer but more watered down creme sheer? If that makes any sense.. 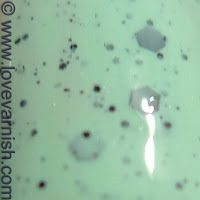 I needed 3 coats for them, and normally I wouldn't like that but it makes sense with these polishes: it allows the glitter to get a nice buildup and create some depth. They applied quite even and weren´t patchy at all (even the yellow wasn´t! ), and with a thin layer of topcoat (I used Essence Better Than Gel Top Sealer, a new bottle so it was quite thin) they all felt smooth to the touch. So, let's take a look, shall we? First up is 423-97, the pink one. I couldn't really capture the true color, it is way brighter than it looks here - it also did not match bottle color. It is like a bubble gum pink in real life. I like the combo of pink and black, it stands out nicely, and it seems fitting for an Easter Egg collection. This wasn't my favorite though. This had great glitter payoff. Second one, 423-98, the blue one. This is a nice and soft shade of blue, the black really stands out in this one. The glitter payoff was a little less, but I still liked the amount. Third one, 423-99, a purple color. Based on the bottle I thought this would be my favorite out of the bunch, but somehow I just didn't like it on me. Great glitter payoff, and good spread too. Fourth is 423-100. A berry/red kind of color. 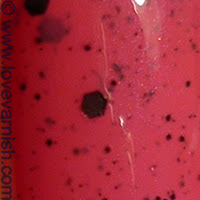 This one had a different formula, it was true jelly like instead of just sheer. It applied heavenly in 2 coats. The glitter payoff is a bit less but I didn't mind, the color itself is so beautiful it would be overpowering if there would be too much black. Fifth one is 423-101, the yellow. 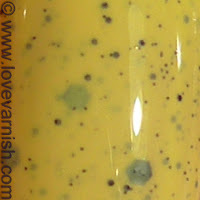 Aaaah, yellow, one of the lesser loved colors in polishworld. It is very fitting for a collection like this and the black glitter is a really fun addition. It is a warm shade of yellow and I am not sure how I liked it on me. Last but not least, 423-102, the green shade. This one looks like mint chip ice cream! This also had a bit different formula, more creamy. I needed 2 coats for this one. Together with the berry/red one I liked this the most. 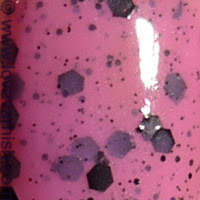 El Corazon polish can be bought by sending an e-mail to ELCorazonzakaz@gmail.com. I do not have any idea of the shipping costs or the price per polish unfortunately. So, there you have it, the 6 shades of the El Corazon Easter Egg Collection! Which one is your favorite? Tell me in the comments! I'm loving these!!! They're really pretty! The pink, purple, blue and yellow are my favorites!! Thanks Marisa! They are such fun colors :). The Yes Love polishes right? It is great more brands are jumping on the bandwagon to make easy access possible! Glad you found them after all! And what a good price! Thanks dear! You are so sweet :). Where did you get them, if I might ask! I'm dying to get my hands on them! Thanks so much! I'm definitely in love with the purple and the light blue one *__* I hope I'll get my hands on some of these, sooner or later! I hope so too! They are so much fun! I got them in Portugal. A friend of mine found them at a chinese store and I asked her to get me some.